It is illegal to leave residential or commercial waste on public land such as streets, laneways, parks, footpaths, car parks or waterways. Leaving items on the side of the road is not an effective way to give away household goods. It is counter-productive because it normalises dumping behaviour in an area, attracts more dumping, and undermines legitimate sharing and reuse methods, such as selling or giving away online. Illegal dumping is ugly, unsafe and places a financial burden on Council waste collection services. Council provides a range of convenient and often free services to help all residents to dispose of their bulky household goods and problem wastes without resorting to illegal dumping. It pollutes our waterways through the stormwater system and attracts vermin such as rats, mice and cockroaches. These areas become unattractive to the local community. Dumped waste can be dangerous to people, particularly when it includes sharp objects, asbestos and glass. A significant proportion of ratepayers’ money is spent each year on cleaning up illegally dumped rubbish and taking action against offenders. Illegal dumping can incur an on the spot fine of up to $4000 for individuals and $8000 for corporations in addition to liability under the POEO Act. Council’s Waste Enforcement Officer regularly patrols the local area, investigating illegally dumped material and issuing Clean-up Notices and/or fines to illegal dumpers. Sydney’s Regional Illegal Dumping (RID) Squad provides additional patrols and specialist investigative capability. The RID squad is funded by the NSW Environment Protection Authority (EPA). 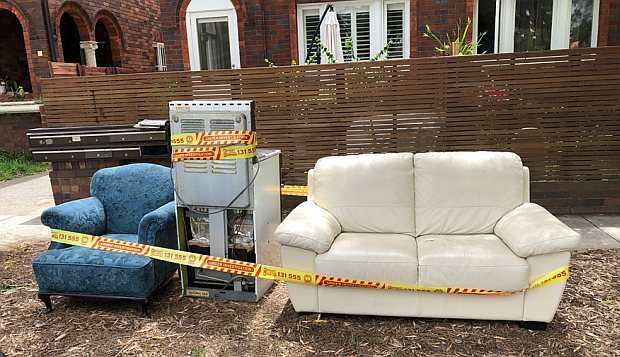 If you see household items, such as furniture or electrical appliances, tree and plant clippings or building and construction waste dumped by the side of the road or in the bush, you can help us find the offender by reporting it the EPA using RID online. When a report is submitted anywhere in NSW, the EPA will alert the relevant local council to the incident so they can respond in the most appropriate way. By submitting a report you are also helping the EPA to develop a comprehensive state-wide database of illegal dumping incidents. This will enable hot spots to be identified and monitored, and strategies to be developed to help reduce dumping. The NSW EPA has a goal of reducing illegal dumping incidents across the state by 30% by 2020. Waverley Council received a grant from the NSW EPA in July 2018 to test a range of behaviour change strategies. The grant is a NSW EPA Waste Less, Recycle More initiative funded from the waste levy. Waverley Council is focusing on streets with a high incidence of reported dumping activity, and involves a range of interventions, such as additional out of hours patrols and investigations, site beautification, surveillance, and community engagement and education. Successful strategies may be scaled to the wider Waverley community, and will be shared with the NSW EPA so that other councils may consider adopting similar tactics. There is no need to dump unwanted items and materials. Households are offered up to three free bulky goods clean-ups per year, including one scheduled and two ‘your call’ clean-up collections. The service is provided to help residents to responsibly dispose of unusable or unrepairable bulky items. Learn more or book a clean-up. Waverley Council is proud to support a range of activities to help keep material circulating within the economy, in alignment with the NSW EPA’s Waste Avoidance and Resource Recovery (WARR) strategy and Circular Economy Policy. Council supports various reuse initiatives such as the Garage Sale Trail, The Bower Reuse and Repair Centre, The Zero Waste Network and hosts ongoing reuse and repair workshops on a variety of topics. Subscribe to our Second Nature e-news to receive information about upcoming events (link). Please contact Customer Service on 9083 8000 or visit the EPA website.